DUBLIN’S BEST FREE CHRISTMAS EVENT FOR ALL THE FAMILY! Keep scrolling to find out what you can expect from your visit to The Moving Crib! The Moving Crib will be opening it’s doors for the 62nd year this Christmas on 27th November. A multi – generational, FREE event that never fails to entertain both children and adults alike. *Due to the fact that we are located in a Listed and Protected building and our Moving Crib is located in the basement of our premises, we are very sorry but we do not have wheelchair or mobility impaired access to The Crib. Our sincere apologies. What is The Moving Crib? This year The Moving Crib will be 62 years old! It has been a key feature of Christmas in Dublin for so long that parents and grandparents, who visited The Moving Crib as children, are now bringing their children and grandchildren to enjoy and re-live this amazing Christmas experience. The Moving Crib, the mention of which evokes a smile and fond memories of Dublin in the ‘rare auld times’ is the only one of its kind in Ireland (if not the world); it is an historical and entertaining experience. This Dublin landmark is as captivating today as it was when it first opened its doors in 1956 and admission is FREE. Find out more about the history of The Moving Crib. What’s said about The Moving Crib? Lots of old world charm and a whole LOT of FUN! Winding your way down to the basement of this lovely Georgian building, you are greeted with a montage of many historical / fun stories, including Noah’s Ark, The Wise Men and many more, its scenes, competitions, an illusion wall and a little touch of magic are all sure to guarantee a fun visit for all the family! Don’t forget to share your photos, use #TheMovingCrib on Facebook, Instagram and Twitter! Each year we run two competitions. The “Draw a Leaf” Competition and also the “Dominican Selfie” Competition! There will also be other competitions running across different Facebook events pages so keep your eyes peeled! 4. Bring it to The Moving Crib this Christmas. The leaves will then be entered into a competition with some amazing prizes! All leaves given to us will remain in The Moving Crib forever! “Check-In” while you’re here! 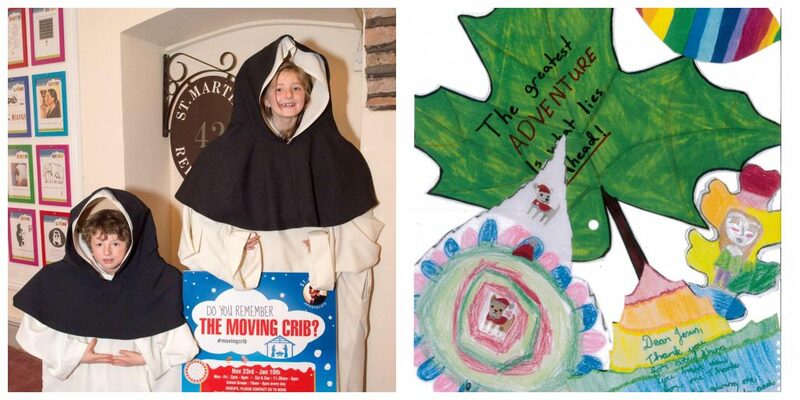 Post a photo from our Dominican Dress Up Stand , to our Facebook Page here or tag us in a Twitter post or Instagram post at @StMartinDublin using the hashtag #TheMovingCrib to be in with a chance to win! Each year, The Moving Crib is carefully assembled, maintained and checked in November and then packed away again in January and stored with care for the next year. This involves significant work, which we do because it is a wonderfully unique way of sharing and reinforcing the gospel story and biblical scenes with children and adults alike. Just listening to parents or teachers going around the crib patiently explaining to their children the meaning of each scene, makes it all worthwhile. You can see The Moving Crib for yourself from late November each year until early January the following year. (Closed Dec 25th, 26th and 1st January every year). Individuals and groups are welcome and best of all, admission is still FREE. While we do remain Free, we have significant maintenance and operational costs and we are asking visitors for a voluntary donation to help with the upkeep.